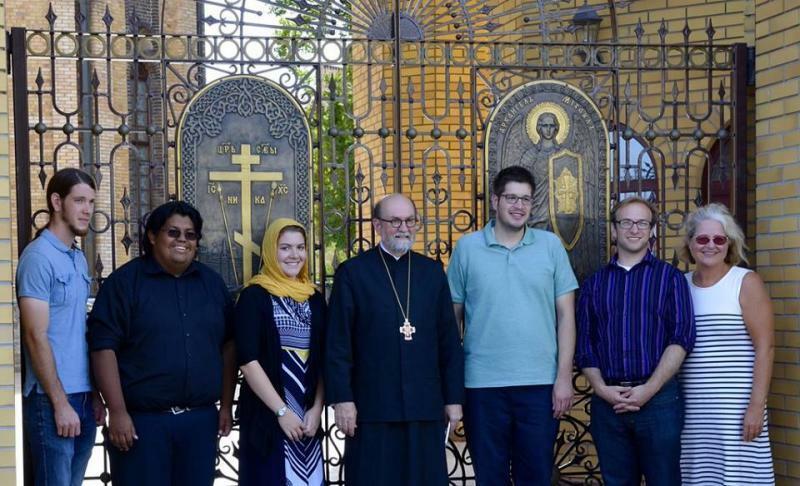 [OCA Youth/Andrew Boyd]—Five young adults representing the Orthodox Church in America were among the forty-plus participants from around the world who attended the international Orthodox youth festival, “Attaining Conciliarity,” at the Monastery of the Annunciation’s Academy, Suprasl, Poland, during the last week of August 2015. They also attended services for the Great Feast of the Dormition at the Monastery of the Nativity of the Mother of God in Zweirki and celebrations marking the 35th anniversary of the Orthodox Youth Fellowship of Poland, presided over by His Beatitude, Metropolitan Sawa of Warsaw and His Eminence, Archbishop Jacob of Bialystok. Sponsored by Syndesmos, the World Fellowship of Orthodox Youth, and hosted by the Orthodox Church of Poland, the gathering marked the first time since 1998 that youth from the OCA are participating in such an event. Representing the Archdiocese of Washington is Victor Lutes, while Janine Alpaugh, William Kopcha and Joseph Green are representing the Dioceses of New York and New Jersey, New England and the South respectively. John Shimchick, also of the Diocese of New York and New Jersey, led the group. Archpriest Dr. Chad Hatfield, Chancellor of Saint Vladimir’s Seminary, Yonkers, NY,delivered the keynote festival address, titled “The Conciliar Model of the OCA: The Dream of Saint Tikhon.” Archpriest Vladimir Misijuk of Bialystok, Poland, spoke on “Attaining Conciliarity: The Task of our Daily Life.” Father Vladimir is an alumnus of Saint Vladimir’s Seminary and former Syndesmos General Secretary. Participants were also able to make personal pilgrimages to the famed monastery at Grabarka, Saint Mary Magdalene Cathedral in Warsaw, and the Nativity of the Virgin Mary Monastery in Zwierki, where the relics of the Holy Child-Martyr Gabriel of Zabludow are enshrined. Other youth movements represented included the Orthodoxer Jungenbund Deutschland from Germany, the Transfiguration Brotherhood and the Kazan Youth Organization from Russia, the Brotherhood of Orthodox Youth from Slovakia, Nepsis from Romania, and the French Orthodox youth organization, ACER-MJO. Syndesmos was established in Paris, France in 1953 as a way to connect Orthodox youth and young adults the world over. In the weeks ahead, a special feature article on Syndesmos, highlighting the Orthodox Church in America’s participation in the organization since its inception, will be featured on the OCA web site. Victor Lutes represented the Archdiocese of Washington at the Syndesmos international gathering in Poland. The following link has photos taken by Victor which document the gathering.